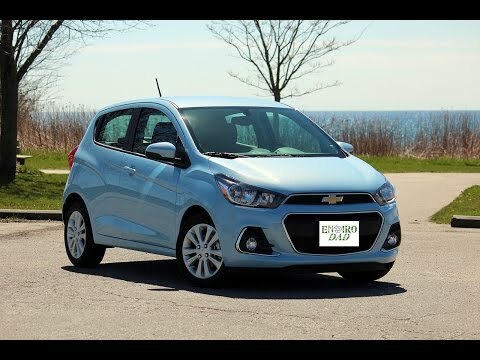 The 2016 Spark is Chevrolet's smallest, least expensive vehicle. All-new for 2016 and now in its second generation, this tiny 4-passenger hatchback has more mature looks than its predecessor, fuel economy that reaches 41 mpg, and improved drivability thanks to a more powerful engine. An all-electric model, the Spark EV, carries over and is limited to California, Oregon and Maryland. This vehicle is so much fun to drive! I will go back to this dealership! My cute little Chevy spark is among my three all time favorites. The first was a 1960's vintage Volkswagen bug, second a 1990's vintage geo metro, and my cute little silver Chevy spark! Do you see a pattern here! I love "everyday man" little sporty cars that are fun to drive. Buying my 2016 spark new was a great feeling and it has been a terrific experience. It is fun to drive, has more pep than most people think and great gas mileage. And my Chevy dealership, salesman and service dept are honest and dependable. I keep in touch with my salesman. I couldn't have asked for more! Who needs a boring car when you can own a spark!! My 2016 Chevy Spark is an excellent car. Though it is a subcompact, it is actually quite roomy. It gets excellent gas mileage & had not required anything more than general maintenance (oil changes, tires, etc) in the two years I've owned it. I got the basic model (no power windows or locks). However, it came with OnStar free for a limited number of months & wifi enabled. It is low to the ground, so - as with any car - you have to use caution when driving in heavy rains etc. Still, I would recommend the Spark to anyone (& since I've owned two... You know I love them). A compact car well suited for young adults and people who live in urban areas. The acceleration is not as fast as other cars, but the you can feel that it still has the power to get you where you need to go. Compact size allows for easy on-street parking. Gas mileage is really great. It only costs me $20 to fill my whole tank. Rides smoothly on the highway and handles turns like a pro. Highway noise is Audible but not overwhelming. I wish there were a button to unlock the trunk because having to remove the key from the ignition to unlock the trunk is inconvenient. General Motors LLC (GM) is recalling certain 2016-2017 Chevrolet Spark vehicles. In the event of a crash, if a young child is seated improperly and not wearing a seat belt while in the front passenger seat, deployment of the front passenger air bag may injure the occupant's neck. As such, these vehicles fail to comply with the requirements of Federal Motor Safety Standard (FMVSS) number 208, "Occupant Crash Protection." The remedy for this recall is still under development. The manufacturer has not yet provided a notification schedule. Owners may contact GM customer service at 1-800-222-1020. GM's number for this recall is 17199.